But where's the iPad app? It didn't take long for Google Maps to rise in popularity on iOS, with the app downloaded more than 10 million times in just 48 hours after it went live. 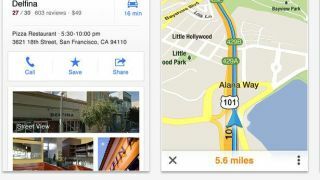 Google Senior Vice President of Commerce and Local Jeff Huber posted the milestone on his Google+ page, congratulating the Maps Team on the app launch along with the seven-plus years of work they have put into maps on iOS devices. Google Maps quickly rose to the No. 1 spot on the iTunes free app charts, and has remained there for the past five days. Customer ratings, of which there are 20,475 so far, have been overwhelmingly positive and earned the app a 4.5-star overall score. Apple Maps got off to a rocky start when it launched with iOS 6 earlier this year, though many of its initial issues have been ironed out to make it a capable mapping option. However, in TechRadar's own early comparison of Google Maps to Apple's iOS default, the Google app still came out on top. While both scored big for turn-by-turn directions, Google's map accuracy edges it ahead, especially when trying to search for businesses rather than an address. Apple's mapping service isn't quite the directionally challenged boogeyman that many users make it out to be, but the meteoric rise of the Google Maps app shows that people are happy to have their preferred mapping service back on iOS. In fact, the main complaint with Google Maps is that the app is currently only available for iPhone users, as iPad owners wait not-so-patiently to begin navigating on the larger screen.